How much popular support was there in the Soviet Union? How did this popular support increase and decrease with time? Here is an infographic that sort of summarizes my question. 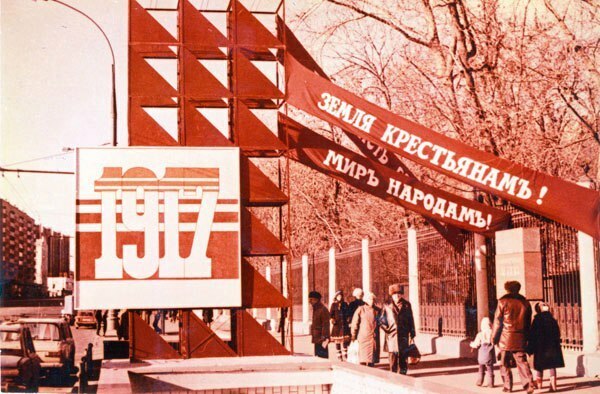 It shows that even at the point of collapse, some 70% of Soviet citizens supported the continued governance by the communist party within the Soviet Union. However, I have doubts about the validity of this information. Also, this only shows a single year, not how popular attitudes increased and decreased as the years passed. What does scholarly research say about this? When I was a US 3rd grader (1983? ), my social studies class informed me that "nobody" in the Soviet Union liked their government. This was obviously false information; at the very least, at least one person would like it, right? As a 7th grader, my history class talked about how the party members were rich and liked to be in power, but everyone else hated the government. How could such a small group hold so much power? The incorrect answer that my classmates came up with was that all Russians were cowards who hated freedom. This is obviously wrong; WWII and the Sputnik were great refutations. Later in life(~2010), I had a Russian friend whose old mother had come to live with him in the US. She was a diehard anti-American; she loved the Soviet Union her whole life, and had always been poor. So at least one non-powerful non-party member supported the government. 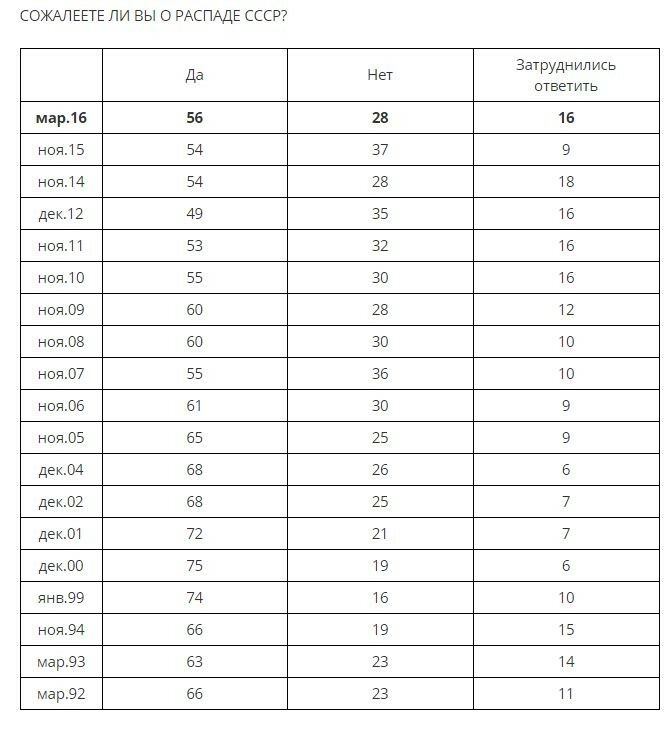 From my reading of how the communist party and government was structured, and how reforms were implemented, it appears that many people - above 60% - supported the revolution and subsequent economic organization. However, I'd love to see some peer-review data. Please note, this question asks for historical truth and not repetition of the ugly cold war propaganda some of us grew up with. Is there a peer reviewed publication where scholars have attempted to make an objective estimate? Did the CIA or British Intelligence declassify their factual estimates? What about other military intelligence? Did the Communist leadership factually study this? If so, has this data been released? Marketing Estimates by McDonalds, Coca-Cola and other companies? Instead of the "popular" vs "not popular" dichotomy, the question asks "how popular." I am also interested in how much support existed as the years passed. This is another answer of mine based on the statistics released by the Levada Center, a leading Russian social study organization. 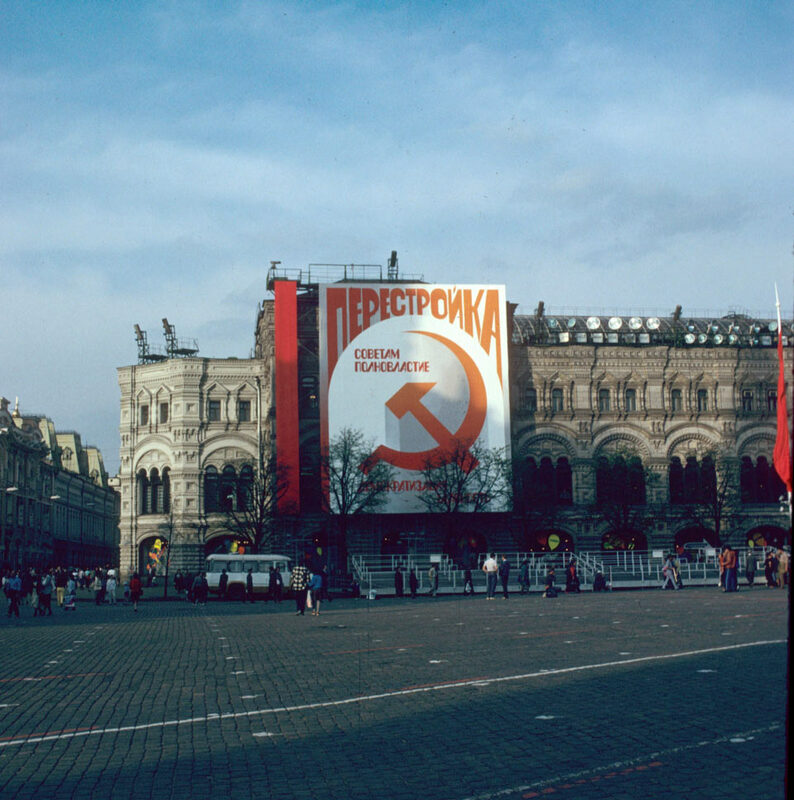 They conducted polls on the popularity of Lenin and the USSR since the 1990s. Do you regret the breakup of the USSR? Yes-No-Not know. In March 1992 66% regretted the breakup the USSR which is thrice those who supported it. The number never fell much below 50%. You were told totally incorrect information, propaganda. The Soviet rule was overwhelmingly popular in the USSR, except possibly the Baltic republics and Western Ukraine. It was somewhat less popular with humanitarian elites though (show business, writers etc.). I want also point out that even the most of those who disliked Socialism or the Communist Party, supported the existence of the USSR as a united country because of patriotism. 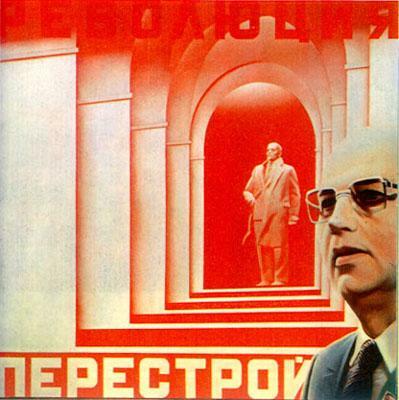 Even when the Perestroika was started, the government never said it would be transition to Capitalism, they said it would be strengthening of Socialism and return to Lenin's principles. Only when it was too late most people realized they were fooled. So when you ask whether the people supported "reforms", well, maybe 60% supported it but because they supported the government and the government said the reforms were to improve Socialism. Perestroika. Gorbachev in front of Lenin. Perestroika. All power to the Soviets (Councils). Notice how they use the Lenin's slogan of 1917, known from the school desk and hammer and sickle to justify the removal of Communist party from power. Perestroika is the continuation of work of the October [revolution]. The symbol of the October Revolution, Aurora cruiser is displayed. "Leninism is the ideological source of Perestroika" on the Pravda ("Truth") newspaper building. The guys are holding the plaque saying "LIE". Some people had realized they were being fooled quite early. Again, Bolshevik slogan from 1917 "Land to the peasants", even written in old orthography, is used to justify introduction of private property on land. I want add this, third answer to clarify some issues with terminology and how the things were run in the USSR. First of all I want to point out that I have learned from the Internet that in the USA there is common sentiment of some distrust of the government, a dichotomy between "we" and the government. But in the USSR there was no such dichotomy. The government was "we". The system of feedback in the Soviet system was overwhelming. If you wanted something concrete done and it was uncontroversial, you would have it done, even if it was formally illegal or against the regulations. A petition usually was more than enough. A petition from an initiative group or a merited citizen was excessive. So, people generally had no grounds to criticize the government: if someone had good arguments for something changed, it would be changed. Any idea would be heard. Coming up with ideas was encouraged. Criticizing the government thus would be like criticizing themselves. At worst they would blame some certain official who barred the idea. The plaque says "Here works the member of the Supreme Council of the Ukrainian SSR". 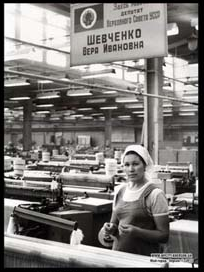 The system of government in the USSR closely followed the people's mentality and their understanding of what is right. But what changed with time is that while in the early USSR the system mostly followed the mentality of the whole people, towards the end of the USSR the main reference base became ethnic Russians and ethnic Russian mentality. It is also worth to note here that many Communist moral principles as implemented in the USSR were borrowed from the moral of the Russian Orthodox Christianity and pre-Communist Russian mentality. Simply put one can argue Communism in Russia was just Christianity without Christ, the similar way some argue the modern ideology in China is just Confucianism painted red and the American ideology is just disguised Protestantism. Thus these principles were quite uncontroversial among the general public. That said, I would say that Socialist principles and Socialist understanding of justice were quite universally accepted, like say "democracy" principles are accepted in the USA. There were people who would advocate for Capitalism or Monarchy but they were fringe, like those who advocates for Communism or neo-Nazis in the USA. So even those who criticized the social order of the USSR would usually bring arguments of the kind that the things were wrong because they did not follow the principles of Socialism. Compare medieval Europe here: there, you usually would not call to replace Christianity with some other religion, but would say this and that bad thing is un-Christian. So if there were things which were disliked, the people would not call to overthrow the whole social order, but to improve the existing one, similarly how in the USA one would not call to overthrow Democracy because of police misbehavior, but would rather say the police's bad behavior was undemocratic. Another thing to understand is that the Communist party was not really a political force in the USSR. It was rather a structure of the state. So the very question about whether one supports the rule of CPSU (which was reflected in the constitution) would look very strange, like if an American was asked whether he is content with the idea of being ruled by the Congress and Senate. Well, maybe someone would say he would prefer a queen, but this would not be quite a common answer. More often you would hear the wishes that bad and corrupt people should not be accepted into the party. A more concrete question would be whether one supports the current government and certain personalities in it. Here, the answers could vary a lot. If you ask somebody in the US whether he supports Democracy and whether he supports Obama, the results will be completely different. Similarly, in the USSR there were a lot of people who disliked this or that minister or party official. Among the USSR leaders the least popular were Khrushchev and Gorbachev. But here again, the majority of people would be loyal. This is because most people are unpolitical. Another feature of Russian mentality is that there a widespread type of people who would support any government irrespective of its policy, so they now support the Capitalist government the same way they supported the government under the USSR. In absence of central media who criticized the government, the popular approval of any current government in the USSR was greater than approval rating of the most of the US presidents. That's why the whole thing of transition towards Capitalism was done from top to bottom, by the incumbent government and masked with Leninist rhetoric. When the majority of the people realized we were going in a wrong direction, it was already too late: Gorbachev had made himself invulnerable by becoming the president. Before him all Soviet leaders could be ousted at any time, the way it happened with Khrushchev, but the president office introduced by Gorbachev had a fixed term, and the impeachment procedure was made highly difficult. Thus the August coup of 1991 followed. Now, last thing to clarify. One can ask, what Russians thought about better economic development in the Capitalist countries compared to the USSR, higher quality of life etc. Here the answers can vary. The official propaganda said the following things: it is not that good in the West for the poor; the wealthy Capitalist countries exploit the poor Capitalist countries, that's why they are rich etc. There were people who believed this propaganda and those who did not. Now, among those who did not, the most common explanation would be along the lines "it is because we (Russians) cannot work well, because of our mentality", and not a blame on Socialism or the government. Other kind of people would say "if Stalin were alive, we would now live better, it was Khrushchev and the others who messed up the things". Moreover, Capitalism was considered simply morally wrong, even if efficient. So even if you would succeed to convince a person that Capitalism is more efficient than Socialism, a common reply would be "Well, maybe, but it is unjust and immoral". Imagine you would try to convince somebody in the USA that a dictatorship like in Saudi Arabia is more efficient and people there live better. Most likely a common person would reply "Okay, but it is unjust and immoral". Now, about the dissolution of the USSR. While in ethnic republics there could be politicians who advocated the secession or dissolution of the USSR, in Moscow not a single politician could advocate it because it would be a political suicide. Even Yeltsin later claimed he was not for the dissolution of the USSR, but that the USSR could not be saved. Even the far-right Monarchist Neo-Nazi group "Memory" were against the dissolution of the USSR, rather calling it a Judeo-Masonic conspiracy. The same goes for the Zhirinovsky's Liberal-Democratic party, and quite every other political group. I'd like to address the issue of the 1991 referendum. Your (otherwise excellent) question misinterprets it completely. The referendum was not about "continued governance by the communist party" because by the time the referendum was held the communist party had already effectively abdicated its power - the train had certainly left that station by then. What the referendum did show was that a majority of Soviet people were in favour of retaining a federal state with an unspecified system of government rather then breaking it up to create a number of smaller independent countries, as had eventually transpired in reality. This was no trifle - it was the main demand of the newly-formed democratic opposition movement and Gorbachev's giving in to it was a clear indication that the party's grip on power was effectively broken. Indeed, the very same bill which abolished the party's monopoly on power introduced the new office of President of the USSR, to be filled by Gorbachev who urgently needed a new job title. Clearly, being merely Secretary General of the CPSU was no longer enough to command full obedience. Do you consider it necessary to preserve the Union of Soviet Socialist Republics as a renewed federation of equal sovereign republics, which will fully guarantee the rights and freedoms of all nationalities? Another telling fact is that if one read's carefully the wiki page on the referendum, it turns out that originally there were 5 questions planned, rather than one. Question 2 and 3 were to refer to the preservation, respectively, of the socialist system and of the Soviets. However, all the extra questions were dropped from the final ballot. Probably because the organizers did not feel they would be able to secure a majority on them. During 1990 and 1991 the Soviet state went into implosion mode. Long-repressed ethnic rivalries escalated into violence, pogroms, and open warfare. The federal leadedrship, no longer sure of itself, tried half-hearted repression and then when things went sour, reneged on its own repressive measures, blaming local army commanders. This cost it its credit with the military and police. The regional elites now sensed weakness on behalf of the central government and saw an opportunity to assert themselves. 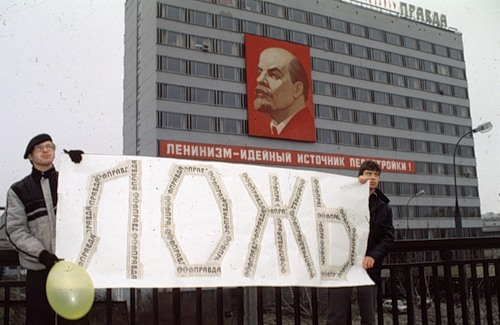 Thus during 1990 many republics of the USSR either seceded or asserted their "sovereignty", finding themselves at loggerheads with the central authorities. Which laws were now to take precedence? The federal or the republican ones? Gorbachev, an astute enough politician, saw what was going on, saw that the old Soviet system was by now beyond saving and took a reasonable step: he invited those republics who have not seceded (9 out of 15) to negotiate a new federal compact. In effect, the Soviet Union was going to be replaced by a new creation, the Union of Sovereign States. The referendum was a political move by Gorbachev to shore up support for the federal center vis-a-vis the republics and to leverage it to gain more power during the negotiations for the drafting of the USS. It probably achieved its purpose. In the event, the new federal compact was to the signed on August 20, 1991. A day before that, on August 19, a group of communist blowhards in Gorbachev's government tried to turn the clock back with their infamous abortive putsch. In the aftermath, both Gorbachev's political reputation and the idea of a federation took such a hit that the final scuttling in December 1991 was almost unavoidable. There are four questions in one. People could like or dislike to certain degree the declared base principles of the state and society, the currently declared principles, the long-term real principles, or the current real principles. All of these were integrated in our minds (I was born in Moscow in 1962) as our views on USSR. And those four aspects were connected and dependent on each other in every mind. Practically, I have seen only one person in all my life till about 1987 that disliked the declared base principles of USSR. I think, that is sufficient statistics for this aspect. That single person was a man of 92 years old who started his life and work before 1917. And he didn't tell his view openly to me, 10-years old then. I merely deciphered his real views later, probably erroneously. As for the view on the real life in USSR in long term, "simple" people were not so simple as educated layer. And all of them knew about horrors of the war and regime of 30-50ties. They did not know statistics, of course, but they knew what happened to surrounding of their family. And that was enough. People on lower Volga/Don knew about the Novocherkassk rebellion, and Leningrad inhabitants knew that hunger in the blockade Leningrad was not for everybody. Maybe the educated layer was less wise, maybe among them there were less people, who were victims, or maybe they simply shut their mouths by a piece of good bread with caviar (in Moscow, mostly), but among them there was many people, who thought that the past was OK, safe some single problems. And these views did not change in families, maybe, only due to dying off. So, mostly people dislike the real past of USSR. But here the majority was not so absolute. As for newly declared principles, such as "the economics must be economical" of Brezhnev, struggle against slacking of Andropov or back to socialism/strengthening the law/acceleration early programs of Gorbi, people simply didn't pay much attention to them. It was merely a reason to speak about and to create a next set of anecdotes. Why? That will be answered in the next paragraph. Mostly people are not interested in principles, but in the reality. But how can they evaluate it? Only by comparison to other realities or to some virtual realities. "Some pretty singer-girl visited USSR and met with Brezhnev. He liked her and asked what she wants. She asked him to open the borders. "Oh, dear! Your feelings to me are so strong, that you want to remain here with me, only you and me, only two of us in the whole land?!" The base problem was, that they compared what they saw in life with what they read in books and saw in movies and were taught at school. The ideals grew higher and higher and people saw greater and greater discrepancy between theory and reality. Everybody knew that the current state simply won't run. The reason why they thought so, were different, and often erroneous. My mother, when visiting as a correspondent, the Priosersk region, was asked by a party leader of the region, if some serious changes are awaited, for it cannot go this way. I was asked in 1983 in the train by a couple of Belorussian teachers, when the revolution will come. Practically everybody hated the state of the USSR. But they wanted it to change. The USSR as such was considered as a given thing, as a frame, and they simply didn't realize that it could disappear. Even in 1989, when I visited my friend, a member of Ukrainian Language Society, (was considered as an utter nationalist one), no one thought about separation, only language autonomy was in question. The change in that view was created by Gorbi in this very 1989, I have seen it myself. When Gorbi said: "The position of Lithuainian delegation is irrelevant"... Millions of people sitting at their TVs became separatists. The sense of USSR existence disappeared. So, it was not a continuous, but an abrupt change in views. Not the answer you're looking for? Browse other questions tagged 20th-century soviet-union russia ukraine or ask your own question. What was the situation of homosexuals in the early Soviet Union?